We love you were you are and walk with you as you become who God wants you to be. We purpose to glorify God, through the power of the Holy Spirit, by winning the lost at any cost, accepting them as members of this local family of God, making disciples of all who choose to follow God, and equipping them for ministry, first in Akron and then in all the world. We pray that God would continue to open doors for our community as we seek to minister to the Akron Community, Northeast Ohio, and the world. The vision of The House of the Lord is to glorify God by providing saving and restorative healing and support for those in Northeastern Ohio who are consciously hurting, through the Good News of Jesus Christ, offered in a relational environment, so that these people may develop significant relationships with God, Jesus Christ, the Holy Spirit, and other believers. We strive to do this primarily through services that are celebrations of the death, burial, and resurrection of Jesus Christ, which are built around the Spirit-filled preaching of the Word of God and a sense of the presence of God, which is experienced in two predominant impressions: God’s transcendent greatness, which is experienced as a sense of awe or excitement when we sense He is present; as well as God’s immanent closeness, which is experienced as a sense of God’s love that often manifests itself in a corporate worship experience with sensations of community and love from other people in the community. This sense of the presence of God would be accompanied by a freedom to express mature emotions, which would result in the conviction of sinners who are present and Christians who are built up, committed to Christ and His church, challenged to grow towards His vision for them, and demonstrating all of this in evangelism. We also strive to realize our vision through Christian Education and discipleship that entails maturing people in the image of Christ, through the Sunday School and educational events, and the one another ministry of believers who exercise their spiritual gifts, through the power of the Holy Spirit, one-on-one and in small groups, so that the local body of Christ may build itself up in love. We continue to pray that God would open doors for our continued expansion as we seek to minister to the Akron Community, Northeast Ohio, and the world. “We love” – because God is love and as His church we must love to be an accurate reflection of Him and His love for the entire world (1 John 4:7-11, John 13:35, Matt 22:37-40, John 3:16). “and walk with you” – by entering and remaining in relationships with them even when we’re hurt and disappointed because 1) we believe each person is worth it and 2) because God didn’t walk away from us, despite the mistakes we’ve made, so we’re committed to not walk away from others (Gen 2:18, 1 John 4:7-11, John 13:35). Love LOUDer than our personal agendas, policies and procedures and so LOUD that the world takes notice as we partner with God to transform Akron first and then the world. There are many churches in any town, city, county, state, or region of the United States of America. Although the diversity of churches can be confusing, especially when they fight against one another, we believe that God has allowed such diversity in churches⎯because there is such a diversity of people. Since churches are made up of people, they are−in a sense−like people, i.e. each church has its own personality and identity. To get along with people, you have to learn their idiosyncrasies, personality quirks, and distinctives. The same is true of churches. There are particular distinctives which make each church different from every other church. In order to minister and serve the Lord effectively, you must be united to a local church. That is the New Testament pattern. To work effectively in a local church, i.e. a local manifestation of the body of Jesus Christ, it is important that you understand the distinctives of the local church where God has placed you. It is with this understanding and motive that we set forth the distinctives of The House of the Lord. We are an intentionally committed to preaching, teaching and living the Gospel of Jesus Christ inside and outside of the walls of the church so that souls can be saved. (Luke 4:22, Matt 28:18-20). We believe that the Bible is the Word of God. Because God loves us He has communicated to us in human words that are adequate for salvation, to reveal to us who God is and to allow us to have an intimate relationship with Him (2 Timothy 3:16). We don’t just believe in the Bible, but we are committed to teach the principles found in the Bible and not be driven to teach a watered-down version of the Gospel to simply teach what the culture wants to hear. We teach the entire counsel of the life-changing Word of God and encourage each member to practice these principles for transformation to occur in their lives (2 Timothy 3:16, Matt 28:18-20, Gal 2:20). God is a relationship unto Himself (i.e. The Triunity of God). Therefore, we believe that relationships are central to God’s church. Because of this, we intentionally strive to foster a sense of fellowship, communion, and intimacy within our church where each person feels welcome, connected and cared for regardless of issues from their past or present struggles they may be dealing with (Gen 1:26, John 1:1, Gen 2:18, Gal 2:20, 1 John 4:16, Matt 22:37-40, 2 Cor 1:1, Mark 10:41-45) . We believe that God is love. And since God is love, we believe that we should be a loving church that appropriately images the love of Christ to a dying world and within our local assembly – we strive to Love Out Loud! (John 3:16, John 13:35, 1 John 4:7-8, Matt 22:37-40, Matt 6:21). Generosity is one of the most supreme external characteristics of God. Therefore, we seek to be a generous church. Among many things we should be generous with love, mercy, grace, and forgiveness. We also believe we should be generous with our giving. Generous giving is a principle found throughout the New Testament which is consistent and flows out of the Old Testament. The New Testament church is instructed to give proportionately to how we have been prospered by God (1 Cor 16:1-2); with a cheerful attitude and not under compulsion based on what each person purposes in his heart (2 Cor 9:7-8, 2 Cor 8:3-4); and in a faithful and systematic manner (1 Cor 16:1-2). We have faith, not in the world or in ourselves, but we have faith in God. This is not an American faith that is simply a blind belief in something that cannot be proven. We have biblical faith. We operate by a faith that requires knowledge, belief and action. So we don’t just believe and teach the Word of God – we commit to fully rely upon and have trust in God for the realization of what God intends to do at and through The House of the Lord. Just as Israel, the First Testament covenant people of God, could never reach its divine destiny and calling through human might and intuition, we believe that The House of the Lord can never reach our divine destiny, live out these Distinctives, or attain our mission and vision as a church on our own. We believe that this can only be accomplished through the power of the Holy Spirit who gives us future power for present use (i.e. the power of the kingdom of God in operation on earth right now) in order to advance the reign of God. Therefore, we believe that “we need a good dose of the Holy Ghost.” Because it is only through the power of the Holy Spirit that we will be an evangelistic, bible-believing, bible-teaching, relationship-centered, loving, generous and faith-operated church powerful enough to transform our local community and the world (Zech 4:26, Acts 1:8, Acts 3:12). 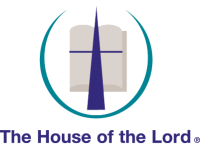 The By-Laws at the House of the Lord are a summary for the membership providing information and guidance in doctrine and principles as together we serve the congregation of the House of the Lord. Download a pdf version of the By-Laws.